It is scientifically proven that you enhance your learning by actively trying to recall words and sentences from memory. 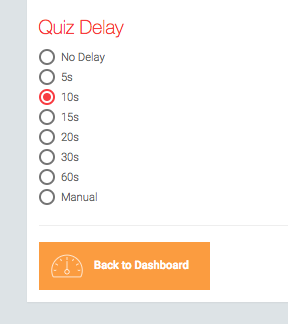 We have therefore implemented a countdown timer that delays the answers of a quiz question and thus gives you time to recall the word from memory. By default we have set it with a 10 second time. In case you recall the word earlier you can just click or tab on the count down timer and the answers will appear immediately. You can change the delay time or switch off the delay completely. You can also set it to “manual” which will remove the countdown and thus you need to always tap for the answers to appear. To make these changes, go to your account settings (click on your user icon in the menu bar on the top right).